If your in the local (to me) area & are in need of certain herbs, that I have in stock, I'll sell you a herbal blend. 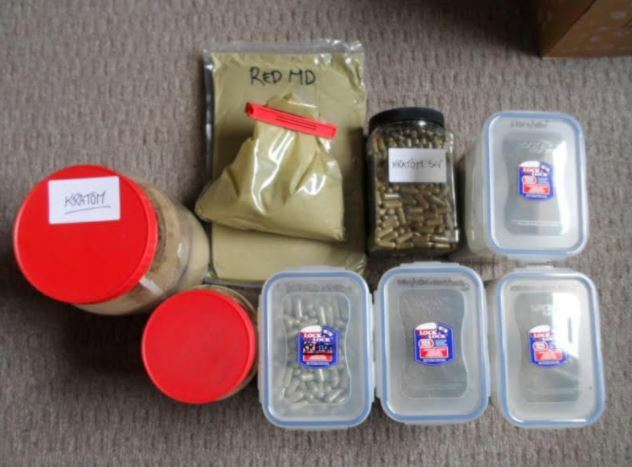 Kratom Vendors are amazing :) It takes about 7-9 days for Kratom to arrive in UK and be delivered. How I now take it is: 60ml shot glass, A2 milk, Kratom dose, sweeteners & 8-10 drops of Chocolate Liquiflav (from bulkpowders.com or Amazon). Fill a fillable, empty teabag with your dose of kratom. Pour over about 250ml boiling water and stir for a few minutes. In a separate mug put in some 'Coconut Milk Powder'. Remove teabag from water and slowly pour Kratom tea into 'Coconut Milk Powder'. Stir well, so you don't get lumps of milk powder etc..
Make a Kratom paste, in my last batch I used Rum. *Optional - You can add other flavouring at this point too if you like. The Rum makes it last a lot longer. Then using Hemp 'Hash' making supplies (see below) I make into a thin type brick of Kratom. By placing Kratom paste between layers of parchment paper, then iron over it for a few minutes. I then cut this up into little bits & I have some throughout the day, or they can be added easier to i.e. drinks/food. Mini Iron - normally used for crafting. See HERE. See pic below for another method. Pic below shows MY current (as of 17/3/18) Kratom stash. Some is just 'Stem & Vein' while some Kratom is combined with Dandelion Leaf (Ground Up). I use Kratom in various ways. I try to stretch it out as much as I can. 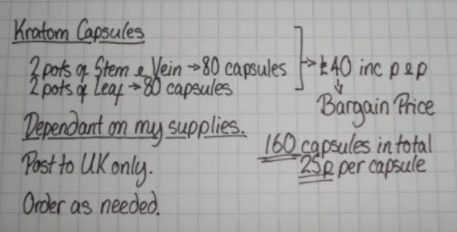 All for the bargain price of £40, just 0.25p per capsule. Postage is included in price. Post to UK only. THC in Cannabis is high. It's the bit that gets you 'high'. Although those who use Cannabis for health conditions don't usually get the 'high'. CBD in Cannabis is low. CBD is the bit that helps with SO MANY health problems. There are more CBD based products becoming readily available now. Cannabis plants grow short & wide. THC in the Hemp I get is low. You WON'T get 'high'. CBD in the Hemp I get is high. More medicinal healing benefits. ​Hemp plants grow tall & narrow.